Naples, Florida is a paradise that has been discovered by many looking to own their piece of real estate in Southwest Florida – including some notable celebrities. Just like us average Joe’s, celebrities are drawn to Naples for it’s quiet sophistication, amazing beaches and privacy. It’s easier to blend-in and avoid the celebrity stalkers of New York and LA. There are not many paparazzi or autograph hounds to bother them as they stroll along Third Street South or browse the chic stores at Waterside Shops. Drawn to the tropical weather and upscale community, Naples has a large population of second home owners — many of whom are wealthy and may own several homes around the world. Celebrities are not much different in that regard. Some are full-time residents and others may live here only part-time or visit periodically when their schedules allow. As a part-time resident, Larry Bird, former NBA star and president of the Indiana Pacers owns waterfront property in Naples. His home is located in the exclusive waterfront neighborhood of Park Shore The property is currently not listed for sale. 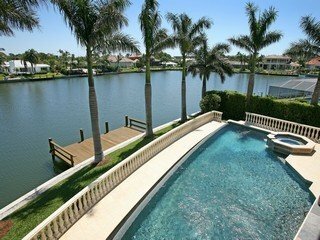 This luxury home, built to Mr. Bird’s specifications, is 6,007 square feet of living area with large media room and waterfront views of Venetian Bay from almost every room. For outdoor entertaining, the home features a tiki hut, summer kitchen and infinity-edge pool overlooking the boat dock. Boat access to the Gulf and beaches is available through Doctors Pass. Sean Hannity – the award winning conservative talk show host and author owns a penthouse condominium in the luxury beachfront residences of Moraya Bay Beach Tower. Mik Ditka – the legendary NFL player, coach and television commentator has owned a home in Wilshire Lakes since 2002. Alex Lifeson – the lead guitarist for Rush owns a condo in Pelican Bay. Bob Seger – the rock star owns a home in the prestigious waterfront community of Seagate and a condo in Kings Lake. Neal Boortz – the nationally syndicated talk radio host owns a condo penthouse in the Dunes. Peter Thomas – a popular voice-over artist, lives with his wife, Stella, in Olde Naples. Robin Cook – the writer is a Naples fixture who owns a Park Shore penthouse with views of the Gulf of Mexico and a secret rooftop hot tub. “Judge Judy” (Judith Sheindlin) – the television star and her husband live in the exclusive luxury enclave of Bay Colony in Pelican Bay. They live in an 8,550 square foot penthouse purchased in 2005 for $6,900,000. You may run into her at Waterside Shops or elsewhere around Naples, Florida. Matt Birk – Two-time All-Pro, six-time Pro Bowl & now Super Bowl XLVII champion center for the Baltimore Ravens retires and decides on Naples, FL as his new home. Matt loves going to dinner and never having to change out of his shorts and flip-flops. The Birks maintain a home in Naples, since moving to New York for Matt’s new executive position with the NFL. Barbara Walters – Barbara Walters retired broadcast journalist, author, and television personality. Barbara Walters has often visited Naples to see her daughter who recently sold her beachfront condo in Moraya Bay Beach Tower for $5,350,000. In the meantime, if you’re in Naples and run into any celebrities please let them be. Just like you, they deserve a little peace and quiet as they enjoy their homes and the beautiful white sand beaches Naples is famous for. Looking for to buy a family house in Naples. The budget is $350 000. Is it possible to buy 3+ bedroom house or a town house with A+ schools? Good neighborhood? I’m looking for nice place to live for 4 months in Naples in Oct/16, I live in Aventura. Hi Margarita: It would be pleasure for us to find you a nice place for you to live for 4 months in Naples starting October 16th. There is a wide variety of properties. Could you give us a few more details of what you would like, such as number of bedrooms, bathrooms, and amenities such as a pool possibly along with the monthly budget you have in mind. We’ll come up with as list of possibilities fitting your criteria for you to choose from. You can possibly schedule a visit from Aventura to see the ones you like, before committing to one, or we can provide greater detail and pictures. All the best. My father loves Napels and I am considering buying him a beach front Condo. Are there any in the $350-500k range? My family is looking for a rental house on Marco Island to accommodate 4 adults and two children for the week of February 18-25, 2017. We would prefer a house with private pool, on water. Can you assist in locating possible rentals? If not, can you refer me to a reputable agent who can assist? Wouldn’t want to live near Sean Hannity. Why wouldn’t you? Sean is a great guy or is your opposition for living near Sean Hannity purely political? Barbara Walters visits the same building in Naples and Sean doesn’t have a problem living near her.